Birchwood is a new apartment complex in one of the most recently-developed sections of the Brambleton community. 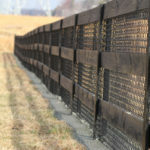 KT helped to transform the sculpted dirt berms along the Loudoun County Parkway into an attractive green space with an in house design utilizing shade, ornamental and evergreen trees from 2-5” caliper or 8-20’ size range and additional planting beds of shrubs and perennials. 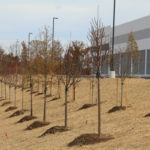 To provide a final touch, the entire berm was turned instantly green with several tractor-trailer loads of sod; kept green by an irrigation system designed and installed by KT Irrigation. KT is proud and pleased to be the landscaper of choice for over seventeen years in this community.